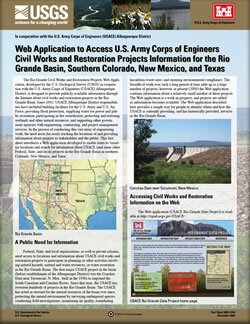 The Rio Grande Civil Works and Restoration Projects Web Application, developed by the U.S. Geological Survey in cooperation with the U.S. Army Corps of Engineers (USACE) Albuquerque District, is designed to provide publicly available information through the Internet about civil works and restoration projects in the Rio Grande Basin. Since 1942, USACE Albuquerque District responsibilities have included building facilities for the U.S. Army and U.S. Air Force, providing flood protection, supplying water for power and public recreation, participating in fire remediation, protecting and restoring wetlands and other natural resources, and supporting other government agencies with engineering, contracting, and project management services. In the process of conducting this vast array of engineering work, the need arose for easily tracking the locations of and providing information about projects to stakeholders and the public. This fact sheet introduces a Web application developed to enable users to visualize locations and search for information about USACE (and some other Federal, State, and local) projects in the Rio Grande Basin in southern Colorado, New Mexico, and Texas. Archuleta, C.M., and Eames, D.R., 2009, Web application to access U.S. Army Corps of Engineers civil works and restoration projects information for the Rio Grande Basin, southern Colorado, New Mexico, and Texas: U.S. Geological Survey Fact Sheet 2009–3104, 2 p.